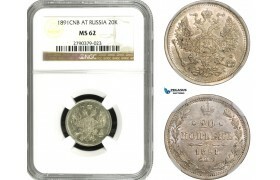 AA263, Russia, Nicholas I, Rouble 1843 СПБ-АЧ, St. Petersburg, Silver, NGC MS62 ..
AA263-B, Russia, State Credit Note, 100 Roubles 1898 (ND 1903-09) S. Timashev, PMG AU55, Pop 1/0 ..
AA439, Russia, Alexander II, Poltina 1867 СПБ-HI, St. Petersburg, Silver, NGC MS62, Rare! 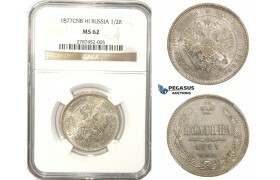 AA439, Russia, Alexander II, Poltina 1867 СПБ-HI, St. Petersburg, Silver, NGC MS62, Rare! 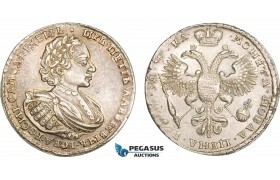 ..
AA504, Russia, Catherine I, 5 Kopeks 1727 КД, Moskow, VF ..
AA505, Russia, Anna, Polushka 1735, XF ..
AA506, Russia, Elisabeth, Kopek 1756 СПБ (Overstruck on 5 Kopeks of Catherine) VF ..
AA507, Russia, Elisabeth, Kopek 1756 СПБ (Overstruck on 5 Kopeks 1727 of Catherine) XF, Rare! 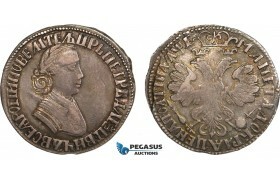 AA507, Russia, Elisabeth, Kopek 1756 СПБ (Overstruck on 5 Kopeks 1727 of Catherine) XF, Rare! 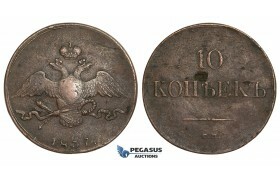 ..
AA508, Russia, Peter III, 10 Kopeks 1762, Some corrosion, Fine ..
AA509, Russia, Nicholas I, 2 Kopeks 1838 CM, Suzun, F-VF ..
AA510, Russia, Nicholas I, 10 Kopeks 1832 ЕМ-ФХ, Ekaterinburg, XF ..
AA511, Russia, Nicholas I, 10 Kopeks 1837 CM, Suzun, F-VF, Rare! 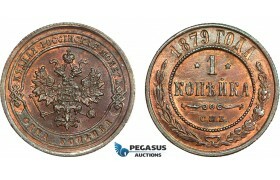 AA511, Russia, Nicholas I, 10 Kopeks 1837 CM, Suzun, F-VF, Rare! 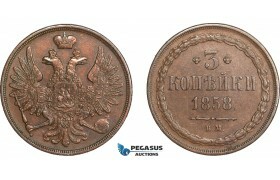 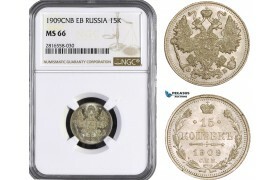 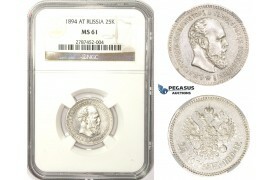 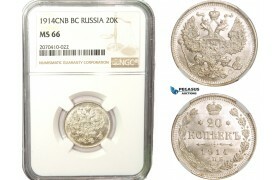 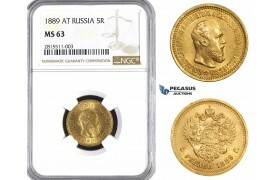 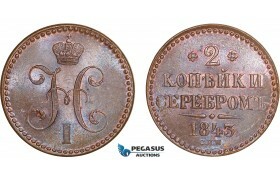 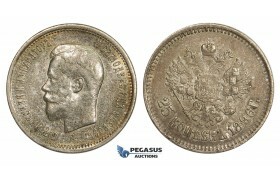 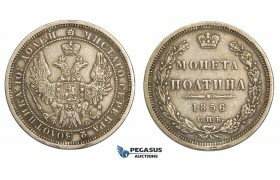 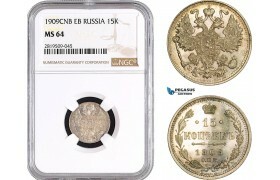 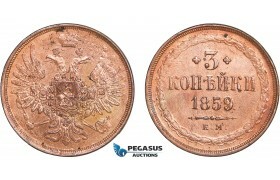 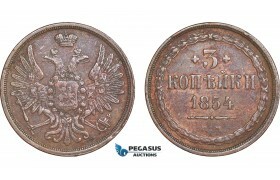 ..
AA512, Russia, Nicholas I, 1 Kopek 1852 ЕМ, Ekaterinburg, Red AU ..
AA513, Russia, Alexander II, Poltina 1856 СПБ-ФБ, St. Petersburg, Silver, VF-XF ..
AA559-R, Russia, Alexander III, 1 Kopek 1884 СПБ, St. Petersburg, NGC MS65BN ..
AA560-R, Russia, Nicholas II, 2 Kopeks 1916, NGC MS65BN (Looks more RB) ..
AA561-R, Russia, Nicholas II, 3 Kopeks 1916, NGC MS62BN ..
AA562, Russia, Alexander III, 25 Kopeks 1894 (АГ) St. Petersburg, Silver, NGC MS61 ..
AA563, Russia, Alexander II, Poltina 1877 СПБ-НІ, St. Petersburg, Silver, NGC MS62 ..
AA564, Russia, Nicholas II, 50 Kopeks 1912 (ЭБ) St. Petersburg, Silver, NGC MS65, Rare Grade! 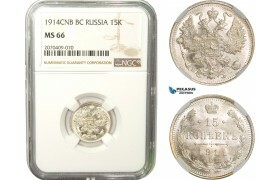 AA564, Russia, Nicholas II, 50 Kopeks 1912 (ЭБ) St. Petersburg, Silver, NGC MS65, Rare Grade! 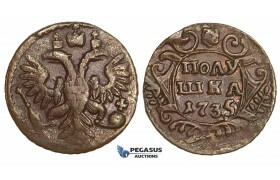 ..
AA704, Poland (under Russia) Nicholas I, 5 Zl. 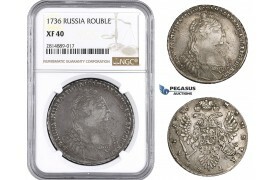 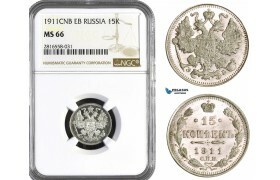 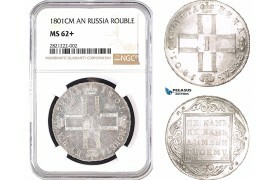 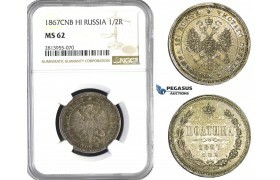 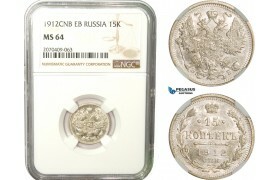 3/4 R. 1840 MW, Warsaw, Silver, Toned gVF ..
AA706, Russia, Anna, Rouble 1736, Moscow Kadashevsky Mint, Silver, NGC XF40 ..
AA707, Russia, Anna, Rouble 1738, Moscow Kadashevsky Mint, Silver, NGC MS61 ..
AA708, Russia, Nicholas I, Poltina 1839 СПБ-НГ, St. Petersburg, Silver, XF-AU ..
AA709, Russia, Alexander III, 5 Roubles 1889 (АГ) St. Petersburg, Gold, NGC MS63 ..
AA710, Russia, Nicholas II, 25 Kopeks 1896, St. Petersburg, Silver, Toned AU ..
AA711, Russia, Nicholas II, Rouble 1899 (ЭБ) St. Petersburg, Silver, Toned VF ..
AA712, Russia, State Credit Note, 100 Roubles 1898 (ND 1898-1903) E. Pleske, Pick# 5a, PMG Ch UNC 64, Very Rare! 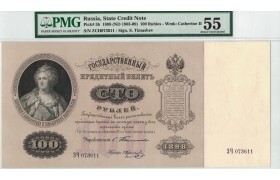 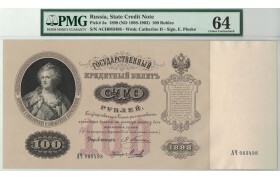 AA712, Russia, State Credit Note, 100 Roubles 1898 (ND 1898-1903) E. Pleske, Pick# 5a, PMG Ch UNC 64..
AA833, Finland (under Russia) Alexander II, Penni 1866, NGC AU58BN ..
AA834, Finland (under Russia) Nicholas II, 5 Penniä 1908, NGC MS66BN, Pop 1/0 ..
AA861, Russia, Alexander II, 5 Kopeks 1869 СПБ, St. Petersburg, NGC MS62BN ..
AA904, Russia, Alexander II, Rouble 1870 СПБ-НІ, St. Petersburg, Silver, Toned XF ..
AA966, Russia, Alexander II, 3 Kopeks 1858 BM, Warsaw, XF-AU, Rare! 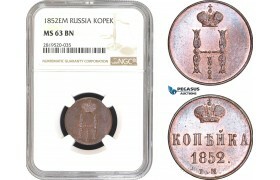 AA966, Russia, Alexander II, 3 Kopeks 1858 BM, Warsaw, XF-AU, Rare! 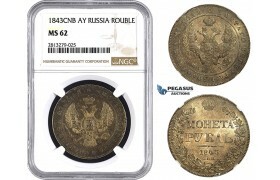 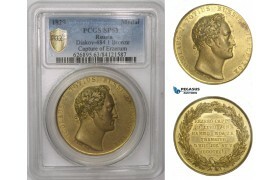 ..
AA977, Russia, Bronze Medal 1817 (Ø56mm, 77.4g) by Tolstoi, 300 Years of Finland Reformation,..
AA978, Russia & Turkey (Ottoman Empire), Gilt Bronze Medal 1829 (Ø36.5mm) by Loos, Captur..
AA979, Russia, Tin Medal, ND (Ø38.5mm, 21.3g) Grand Duke Konstantin Vsevolodovich, VF ..
AB005, Russia, Elisabeth, Rouble 1754 СПБ-IМ, St. Petersburg, Silver (25.82g) Toned AU ..
AB045, Russia, Nicholas I, 5 Kopeks 1852 EM, Ekaterinburg, NGC MS63BN, Pop 3/0 ..
AB046, Russia, Alexander III, 5 Kopeks 1890 СПБ-АГ, St. Petersburg, Silver, NGC MS63 ..
AB047, Russia, Alexander II, 10 Kopeks 1861 СПБ, St. Petersburg, Silver, NGC MS63 ..
AB048, Russia, Nicholas II, 15 Kopeks 1898 СПБ-АГ, St. Petersburg, Silver, NGC MS66, Rare so nice! 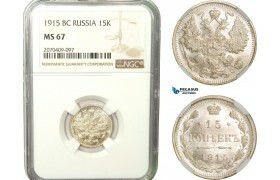 AB048, Russia, Nicholas II, 15 Kopeks 1898 СПБ-АГ, St. Petersburg, Silver, NGC MS66, Rare so nice! 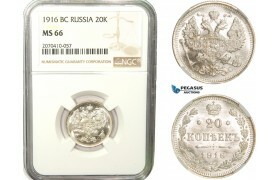 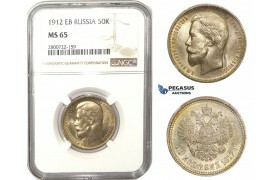 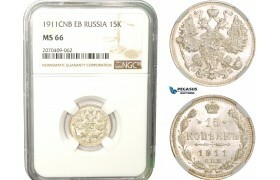 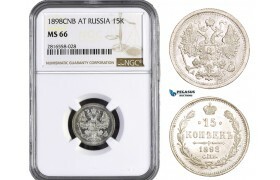 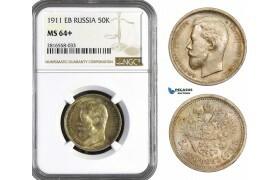 ..
AB049, Russia, Nicholas II, 15 Kopeks 1908 СПБ-ЭБ, St. Petersburg, Silver, NGC MS64 ..
AB050, Russia, Nicholas II, 15 Kopeks 1909 СПБ-ЭБ, St. Petersburg, Silver, NGC MS66 ..
AB051, Russia, Nicholas II, 15 Kopeks 1911 СПБ-ЭБ, St. Petersburg, Silver, NGC MS66 ..
AB052, Russia, Alexander III, 20 Kopeks 1891 СПБ-АГ, St. Petersburg, Silver, NGC MS62 ..
AB053, Russia, Nicholas II, 20 Kopeks 1909 СПБ-ЭБ, St. Petersburg, Silver, NGC MS66 ..
AB054, Russia, Nicholas II, 50 Kopeks 1911 (ЭБ) St. Petersburg, Silver, NGC MS64+, Rare! 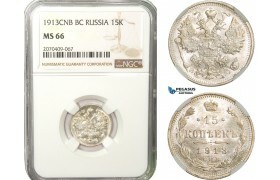 AB054, Russia, Nicholas II, 50 Kopeks 1911 (ЭБ) St. Petersburg, Silver, NGC MS64+, Rare! 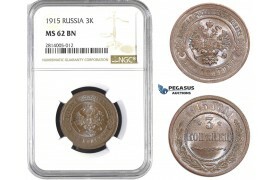 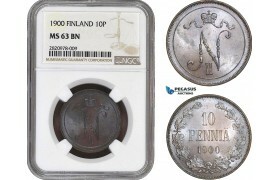 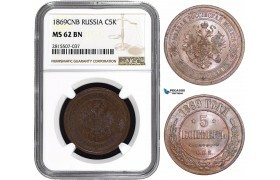 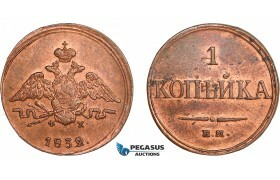 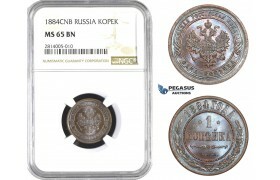 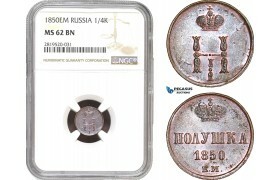 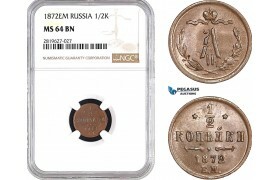 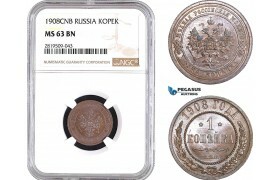 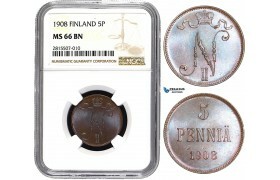 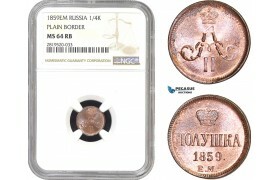 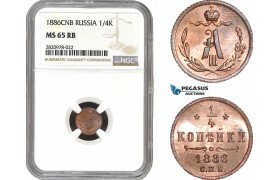 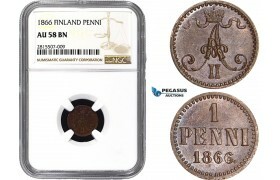 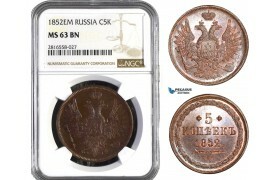 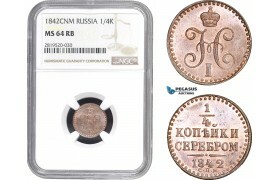 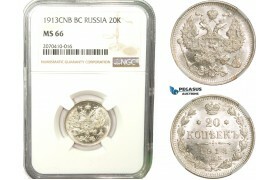 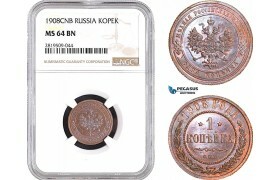 ..
AB055, Russia, Nicholas II, 50 Kopeks 1913 (BC) St. Petersburg, Silver, NGC MS62 ..
AB148, Russia, Alexander II, 1 Kopek 1855 BM, Warsaw, Brown AU, Rare! 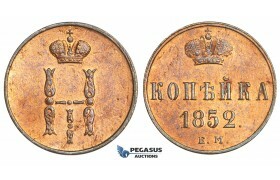 AB148, Russia, Alexander II, 1 Kopek 1855 BM, Warsaw, Brown AU, Rare! 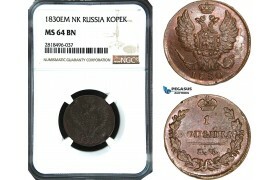 ..
AB149, Russia, Alexander II, 3 Kopeks ND (Full mirror brokage) Scratches, VF, Rare! 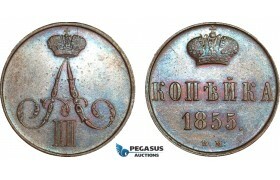 AB149, Russia, Alexander II, 3 Kopeks ND (Full mirror brokage) Scratches, VF, Rare! 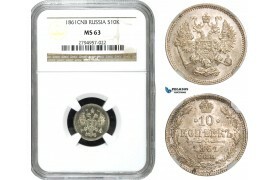 ..
AB150, Russia, Alexander II, Rouble 1881 СПБ-НФ, St. Petersburg, Silver, Toned AU (Some scratches) ..
AB156, Russia, Peter I, Poltina 1705, Moscow, Silver (13.63g) Bit. 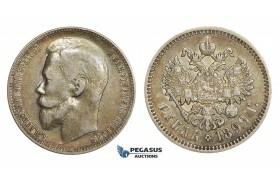 552 (R3) Toned XF, Very Rare! 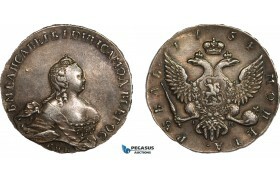 AB156, Russia, Peter I, Poltina 1705, Moscow, Silver (13.63g) Bit. 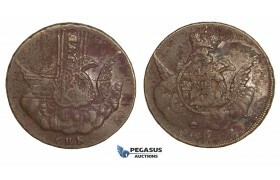 552 (R3) Toned XF, Very Rare! 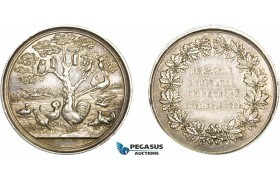 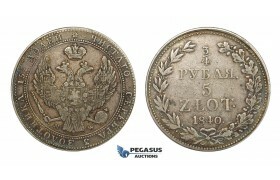 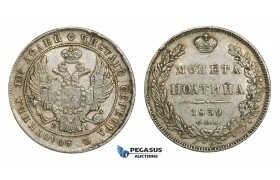 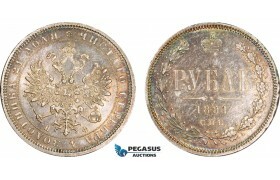 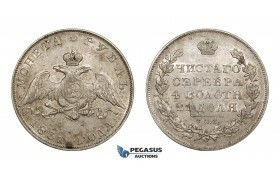 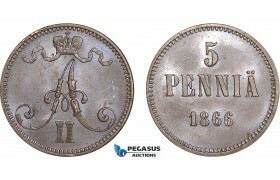 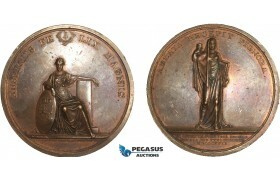 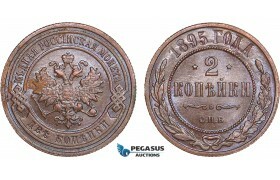 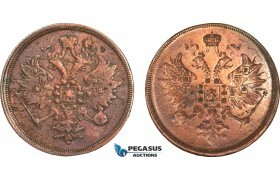 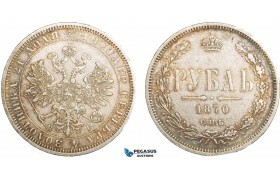 ..
AB202, Russia & Latvia, Silver Medal ND (c. 1880) (Ø39mm, 28.5g) by Schuppan, Riga Poultry Contest, Owl, RR!! 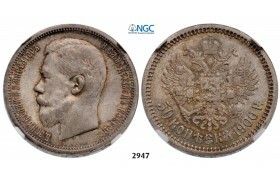 AB202, Russia & Latvia, Silver Medal ND (c. 1880) (Ø39mm, 28.5g) by Schuppan, Riga Poultr..
AB269, Russia, Nicholas II, 15 Kopeks 1911 СПБ-ЭБ, St. Petersburg, Silver, NGC MS66 ..
AB270, Russia, Nicholas II, 15 Kopeks 1912 СПБ-ЭБ, St. Petersburg, Silver, NGC MS64 ..
AB271, Russia, Nicholas II, 15 Kopeks 1913 СПБ-BC, St. Petersburg, Silver, NGC MS66 ..
AB272, Russia, Nicholas II, 15 Kopeks 1914 СПБ-BC, St. Petersburg, Silver, NGC MS66 ..
AB273, Russia, Nicholas II, 15 Kopeks 1915 СПБ-BC, St. Petersburg, Silver, NGC MS67 ..
AB274, Russia, Nicholas II, 20 Kopeks 1913 СПБ-BC, St. Petersburg, Silver, NGC MS66 ..
AB275, Russia, Nicholas II, 20 Kopeks 1914 СПБ-BC, St. Petersburg, Silver, NGC MS66 ..
AB276, Russia, Nicholas II, 20 Kopeks 1915 СПБ-BC, St. Petersburg, Silver, NGC MS67 ..
AB277, Russia, Nicholas II, 20 Kopeks 1916 СПБ-BC, St. Petersburg, Silver, NGC MS66 ..
AB306, France & Russia, 2 Francs (AN 9) 1801 ESSAI, Maz-589A, NGC MS63BN, Pop 1/0, Rare! AB306, France & Russia, 2 Francs (AN 9) 1801 ESSAI, Maz-589A, NGC MS63BN, Pop 1/0, Rare! 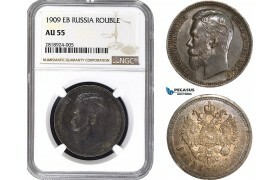 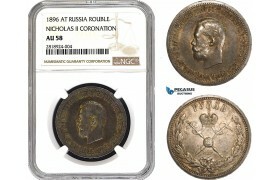 ..
AB400, Russia, Nicholas II, Coronation Rouble 1896, St. Petersburg, Silver, NGC AU58 ..
AB401, Russia, Nicholas II, Rouble 1909 (ЭБ) St. Petersburg, Silver, NGC AU55, Rare! 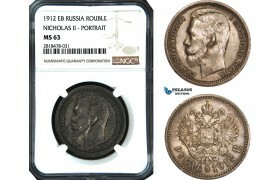 AB401, Russia, Nicholas II, Rouble 1909 (ЭБ) St. Petersburg, Silver, NGC AU55, Rare! 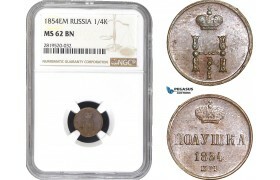 ..
AB407, Russia, Alexander II, 1 Kopek 1879 СПБ, St. Petersburg, UNC (Min. 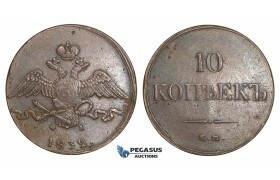 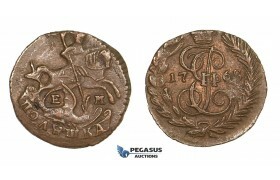 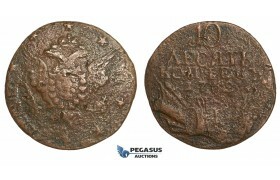 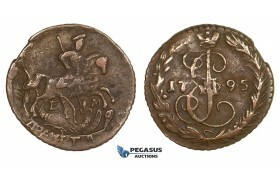 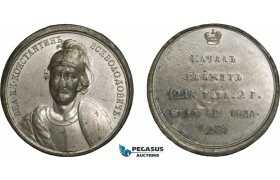 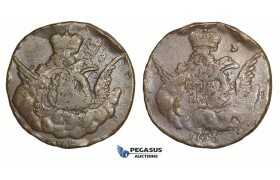 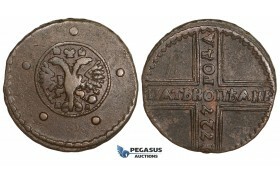 Hairlines) ..
AB419, Russia, Peter I, Rouble AѰКA (1721) K, Kadashevsky mint, Moscow, Silver, Bit. 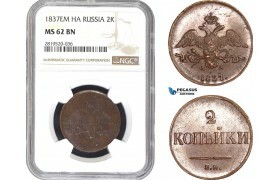 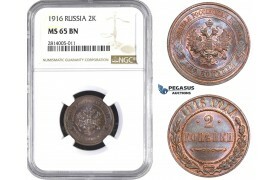 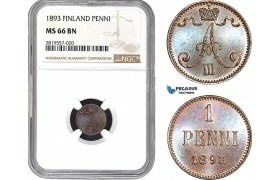 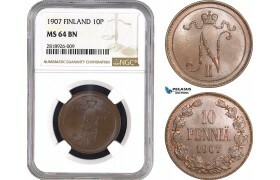 422 (R) Toned &..
AB473, Germany (Military coinage) East Prussia, 1 Kopek 1916-J, Hamburg, NGC MS65, Pop 1/0 ..
AB517, Russia, Nicholas I, 1 Kopek 1830 ЕМ-ИК, Ekaterinburg, NGC MS64BN ..
AB518, Russia, Alexander I, 2 Kopeks 1810 EM HM, Ekaterinburg, NGC MS64BN, Pop 1/0 ..
AB520, Russia, Nicholas II, Rouble 1912, St. Petersburg, Silver, NGC MS63 ..
AB537, Finland (under Russia) Nicholas II, 10 Penniä 1907, Helsingfors, Copper, NGC MS64BN ..
AB564, Finland under Russia, Alexander II, 5 Penniä 1866, Lustrous AU (Few marks) ..
AB568, Russia, Nicholas I, 1 Kopek 1832 ЕМ-ФХ, Ekaterinburg, AU ..
AB569, Russia, Nicholas I, 2 Kopeks 1843 СПМ, Moskow, Lustrous Red Brown UNC ..
AB570, Russia, Nicholas II, 2 Kopeks 1895 СПБ, St. Petersburg, AU-UNC (Spot) ..
AB571, Russia, Nicholas I, 3 Kopeks 1842 СM, Suzun, Stained AU, Bit. 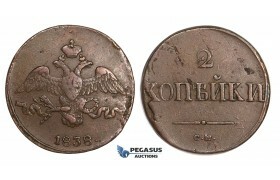 725 (R1) Rare! 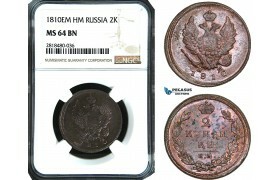 AB571, Russia, Nicholas I, 3 Kopeks 1842 СM, Suzun, Stained AU, Bit. 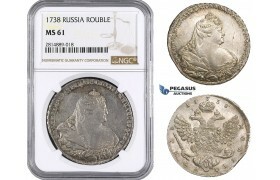 725 (R1) Rare! 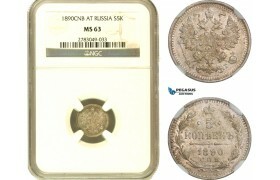 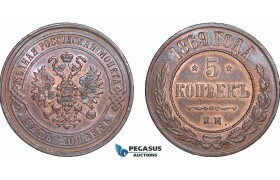 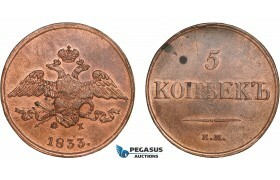 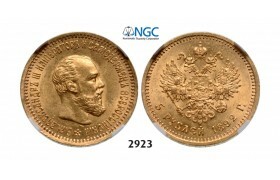 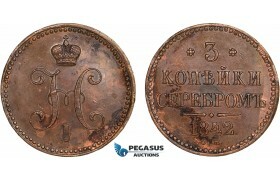 ..
AB572, Russia, Nicholas I, 3 Kopeks 1854 EM, Ekaterinburg, VF-XF ..
AB573, Russia, Alexander II, 3 Kopeks 1859 EM, Ekaterinburg, Cleaned AU ..
AB574, Russia, Nicholas I, 5 Kopeks 1833 ЕМ-ФХ, Ekaterinburg, Lustrous AU (Spots) ..
AB575, Russia, Alexander II, 5 Kopeks 1869 EM, Ekaterinburg, AU ..
AB676-R, Finland (under Russia) Alexander III, 1 Penni 1893, NGC MS66, Pop 4/0 ..
AB739, Russia, Alexander II, 1/2 Kopek 1872-EM, Ekaterinburg, NGC MS64BN, Pop 1/0 ..
AB740, Russia, Nicholas II, 1 Kopek 1903, St. Petersburg, NGC MS64BN ..
AB741, Russia, Nicholas II, 1 Kopek 1908, St. Petersburg, NGC MS64BN ..
AB742, Russia, Nicholas II, 1 Kopek 1908, St. Petersburg, NGC MS63BN ..
AB743, Russia, Nicholas II, 15 Kopeks 1909, St. Petersburg, Silver, NGC MS64 ..
AB744, Russia, Paul I, Rouble 1801 СМ-АИ, St. Petersburg, Silver, NGC MS62+ ..
AB814, Russia, Nicholas I, 1/4 Kopek 1842 СПМ, Izhora, NGC MS64RB, Pop 1/0 ..
AB815, Russia, Nicholas I, 1/4 Kopek 1850 EM, Ekaterinburg, NGC MS62BN ..
AB816, Russia, Nicholas I, 1/4 Kopek 1854 EM, Ekaterinburg, NGC MS62BN ..
AB817, Russia, Alexander II, 1/4 Kopek 1859 EM, Ekaterinburg, NGC MS64RB, Pop 1/0 ..
AB818, Russia, Nicholas I, Kopek 1852 EM, Ekaterinburg, NGC MS63BN ..
AB819, Russia, Nicholas I, 2 Kopeks 1837 EM HA, Ekaterinburg, NGC MS62BN ..
AB874, Finland (under Russia) Nicholas II, 10 Penniä 1900, NGC MS63BN ..
AB901, Russia, Alexander III, 1/4 Kopek 1886 СПБ, St. Petersburg, NGC MS65RB ..